This is a one of a kind specialized event and no promotions, coupons or discounts can be used at this event. 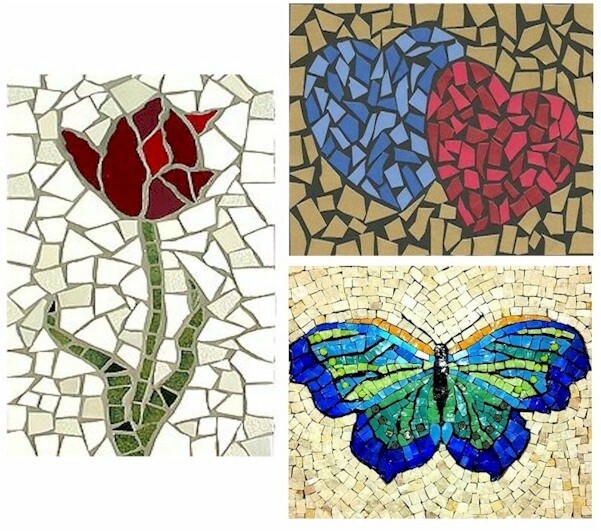 This Mosaic Tiling class starts at 6:30 (earlier than normal) and goes for 4 hours until 10:30. SPECIAL NOTES: This event is NOT A PAINTING. It is an actual ceramic tile mosaic design on wood. You will be working with broken tiles, glue and mortar. Designs will be drawn for you. You can pick one of 3 designs being done at this craft event. As the designs shown are only samples, made 6 months ago, and tile colours repeatedly change with supplies available at hardware stores, the colours available at your class may not match the images shown on the website. We are working with hundreds of broken tiles that have a variety of changing colours, textures and shapes for each class. Please also note: There will be cutting and clipping of tiles required for this class. It can also be a little dangerous. As you are working with broken tiles there is the small possibility of cuts as tiles can be sharp! We will supply protective eye wear and protective gloves to reduce possible accidents. Care is very important when working with broken tiles. Event Info: Your admission includes everything needed to recreate one of the featured Mosaic art pieces.. From aprons, tiles, cutters, glue, grout, sponges, etc to step-by-step instruction from local professional artist and a 10" x 12" finished mosaic tile board to take home! We ask that you arrive early so that you can select your seat. If you are in a large group the earlier the better. This will give you time to get your drinks and any food you might like. Cancellation Policy: Art and Wine is an entertainment event, much like a concert, dinner theater, or movie theater. We only accept cancellations or reschedules if 4 days or more notice is provided. Cancellations should be made via email or phone. We are unable to refund reservations if less than 4 days (96 hours) notice has been given. Don’t worry though your admission is fully transferable to someone else however they must tile the same design as you have chosen since it will have already been drawn for you.